Join Trust for America's Health on Friday, March 8th from 1:00 - 3:00 p.m. for a briefing that will explore a new initiative focused on state policies that can improve health and lower healthcare costs. National experts will participate in a panel presentation highlighting the importance of addressing the social determinants of health through policy change at the local, state and national level. 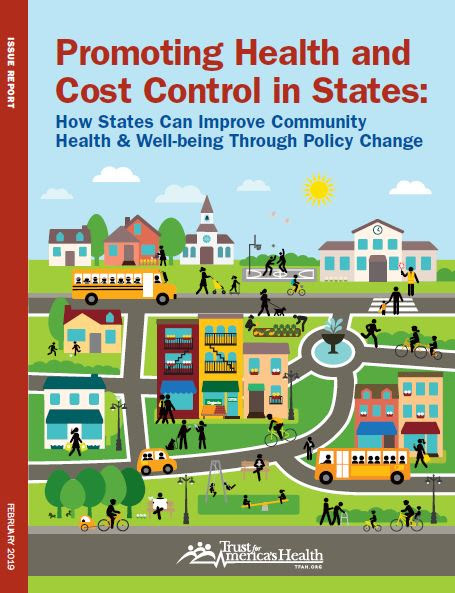 Trust for America's Health's (TFAH) new report, Promoting Health and Cost Control: How States Can Improve Community Health and Well-being Through Policy Change highlights 13 policies, all outside the healthcare sector, that if adopted by states can improve the health and well-being of their residents. The report provides detailed information on its recommended policies, including descriptions, summaries of the health and economic evidence, case examples, and considerations for design and implementation. Additionally, it highlights a set of complementary policies for state officials to consider where the recommended policies alone may not be enough to achieve state and national goals for health improvement. Goal 1: Support the connections between health and learning. Goal 2: Employ harm-reduction strategies to prevent substance misuse deaths and related diseases. Goal 3: Promote healthy behavior. Goal 4: Promote active living and connectedness. Goal 5: Ensure safe, healthy, and affordable housing for all. Goal 6: Create opportunities for economic well-being. Throughout Colorado, unintentional injury continues to be a leading cause of death and disability for all age groups. Thousands of individuals are affected by injury or injury-related deaths each year. Evidence shows that effective prevention programs and strategies work to reduce these statistics. With this in mind the Injury Prevention Program at Children's Hospital Colorado will be hosting the American Trauma Society Injury Prevention Coordinator’s Course (IPCC) June 6 - 7, 2019 at the Anschutz Campus in Aurora, CO. 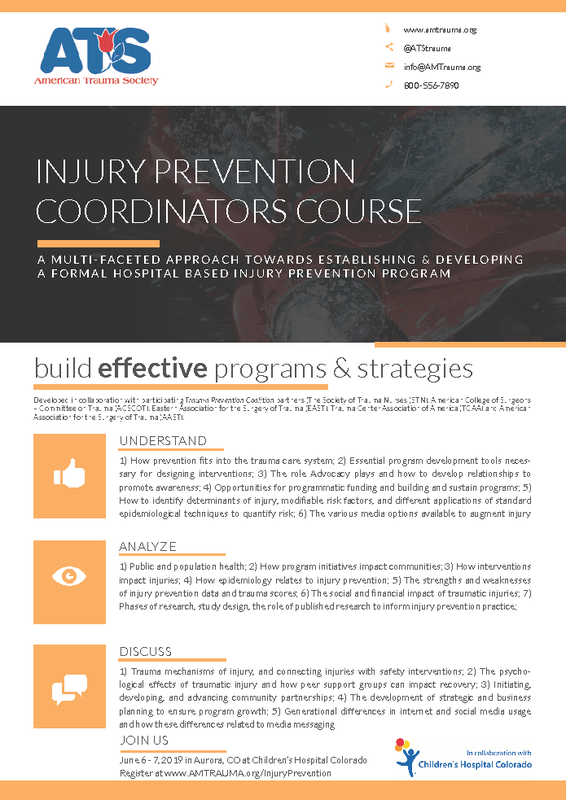 This 2-day course is geared towards establishing and developing a formal hospital-based, multi-faceted injury prevention program, and was developed by seasoned injury prevention professionals across the country. It is designed to cover 14 chapters on injury and data analysis, education, program development, advocacy, promotion, and more! For more information, including course registration, please visit www.AMTRAUMA.org/InjuryPrevention. You're invited to use Connecting the Dots Selector, a new tool from CDC that makes it easier to see links between different types of violence. A clear understanding of these connections can help you plan strategies to prevent multiple forms of violence at once. This tool enables you to connect the overlapping causes and what can protect people at individual, relationship, community, and societal levels. Social-Ecological Model (SEM): Select the Individual, Relationship, Community, or Society level of the SEM to see the risk and protective factors at that level and the violence types associated with each. Risk and Protective Factors: Within any level of the SEM, click on a risk or protective factor to see the violence types associated with it. Violence Types: Click on any violence type to explore the risk and protective factors associated with it at each level of the SEM. 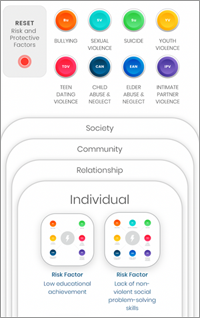 Check out the connections and how their insights can help stop violence before it starts. CDOT's Highway Safety Office has released an RFA on Community Level Approaches to Alcohol-Impaired Driving Prevention. The purpose of this CDOT funding, with technical assistance support from CDPHE, is to partner with local agencies to increase safety by addressing the root causes of alcohol-impaired driving. Awarded agencies will engage community stakeholders in decision-making and use local data to identify evidence-based or evidence-informed prevention strategies that reduce risk factors and promote protective factors commonly associated with excessive alcohol use. By setting population-level goals to address excessive alcohol consumption, coalitions can drive efforts that reduce alcohol-impaired driving crashes and fatalities as well as other alcohol-related consequences, such as violence, cancer, and poor mental health outcomes. CDC is pleased to announce the release of 2017 data from the Pregnancy Risk Assessment Monitoring System (PRAMS). Researchers can request the most recent year of data, as well as prior years’ data. To determine the data availability by site and year from 1988–2017, please access the tables under Years of Data Available. PRAMS was developed in 1987 to help reduce infant morbidity and mortality by providing data not available elsewhere about pregnancy and the first few months after birth. It is part of CDC’S Safe Motherhood and Infant Health Initiative. PRAMS is funded in 51 sites and covers 83% of all live births in the United States. Sites now include 47 states, New York City, Washington, DC, Puerto Rico, and the Great Plains Tribal Chairman’s Health Board. Identify groups of women and infants at high risk for health problems. Provide information for state health officials to improve the health of mothers and infants. Allow states and CDC to monitor changes in maternal and child health indicators, such as breastfeeding, smoking and drinking during pregnancy, and infant health. Address emerging health issues of particular concern to pregnant women, including surveillance for disaster preparedness and pandemic infectious disease.